If my first novel finally appeared …it was because I was part of a paper commission (it was during the war). It was bad…. 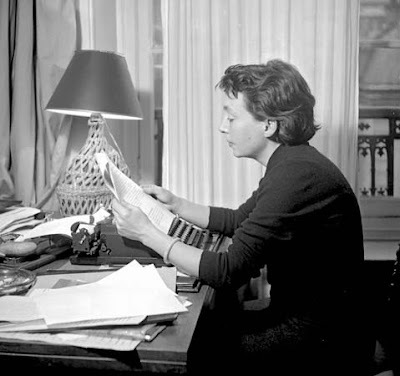 To be sure, everyone not independently wealthy had to have a job, but her position as censor for the Nazi occupiers was certainly one that Duras was eager to forget. Nor did she want to remember that before the war she had worked in the publicity department representing France’s colony in Indochina during the late 1930s, especially at the 1937 International Exposition, the last great manifestation of French colonialism. Most of the French did not object to France having colonies at the time. But Duras, with her considerable powers to mythologize the past, knew how to invent a suitably leftist record for herself. Robbe-Grillet’s rfather was a petainist, but perhaps he was better off in never hiding it, whiether or not he simply couldn’t because it was so well known, or because he didn’t condemn his father for it. It’s been some time, but I believe he writes about his family and early years in ‘Ghosts in the Mirror.’ There are also some filmed lectures with that professor from CA who is something of a Robbe-Grillet scholar, in which Duras comes up. Descendants and friends of those who were or are in positions of bad political odour, of couirse, do not tend to condemn them as strongly as those who are at a distance. Have you read Duras’s essay-account of her agonies in getting off alcohol? I thought it revearling about her psychology, the same who would write in another essay in the same book (I think it was a different essay) that ‘everybody in Paris knows each other’, meaning an elite she has definied, of course, but still almost accurate–although I’ve yet to find out if Mme. D—— knows M. L—–, who are of different kinds of elites. She seemed to almost revel in the horrors of hallucinations of animals and monstrous things in the cold turkey process she goes through. It is as if it would not have been enough to simply get off the boozing, but she needed to do a grotesquely painful version of it were it to be ‘real’. I understand this to a degree, in the sense that to fully discard something that is counter-productive but associated with pleasurable sensations, you really need something equally intense–but it actually works better if you replace with pleasurable sensations, or you end up just pretending that you love things you really hate. Maybe there was joy in the writing about it–which she wouldn’t have had had she done it in a gradual and less painful way. This has also been some time, and I don’t have that book handy either, but I believe she went through this with a younger lover, so really that wasn’t valiant enough either, was it? She should have done it all alone if the treatment was to really take! Her ‘Disney World’ of ‘repressed and reversed delirium tremens’ is a bit much. It’s not as though if she’d used some carefully administered drugs under a physician’s care that would have been a worse addiction than her obvious continued addiction to coming up with a gallery of freak hallucinations that she could hold up as if to say ‘look at all the horrible beauty I went through! I know what you’re saying, Patrick, but it may be that M. Duras was just really, truly, a writer and it had to be worked out that way, via the horrible beauty, reportable to all. Sorry. I’ve long been just a little in love with her. She went through it with Yann Andréa, her gay companion, the de-boozing. There’s a great para in the NYRB piece, toward the end, very Edmund White. I wanted to use the phrase “fag hagiography” in the post, but was scared I’d be misunderstood. Go look though, it’s the third to last paragraph and it sounds so much better en français. but it may be that M. Duras was just really, truly, a writer and it had to be worked out that way, via the horrible beauty, reportable to all. Well, of course it was that, but I’m fascinated by the frequent attraction to what seems, for lack of a better way to say it, to the authenticity of pain, as if there could be no sense of progress without it. Thanks for pointing out the paragraph, I always get to White when I know he’s around. I’ve always admired her too, and no less now. But I do remember with amusement when the old influential but vulgar film critic Pauline Kael was exasperated with one of MD’s films and was reduced to saying ‘some people are too French for their own good.’ That’s bound to happen. This reminded me vaguely of Susan Sontag’s old New Yorker piece on Artaud–one may have to be a little bit in love with either of those, as you say. Duras presents problems of the sort I can’t go very far with, remain interested in–just to take the vastly documented alcoholism cure: I hadn’t known till just now that she returned to alcoholism, which would then only allow the cure to remain meaningful for the true aficionado. Many feel that way about Robbe-Grillet and won’t do the work involved to learn the serialist aspects of his grammar (whether or not translated), but I’m a huge fan. Was interested to read about the film version of ‘India Song’, which stars Delphine Seyrig, the luminous actress of ‘Marienbad’ who has the only screen presence I’ve seen that is comparable to Garbo’s. Somehow I’d missed this one, having seen most of Seyrig’s superb work, including narration of works like ‘Les Chansons de Bilitis’. This is off-topic, but I had remembered from the old Sontag piece on Artaud some mention of his film appearances, and have since seen him as the knife-grinder in Fritz Lang’s early-30s ‘Liliom’ with Charles Boyer before he came to Hollywood (which might interest Artaud enthusiasts). You probably know Robbe-Grillet had cine-romans of his films, of which I was reminded upon White’s description of Duras’s going back and forth between media. Good work by White, always an important voice. I knew the real-life version of one of his most important characters, but never knew he’d been the model for this character while the person was alive. And didn’t read it till I googled and found out that they were one and the same.